I bought my first two vintage dresses for Ruby online this week (above and below) after seeing Danielle share her finds on Twitter. Then I saw what Holly picked up for Delilah and wanted to share my own excitement over getting to play dress up! 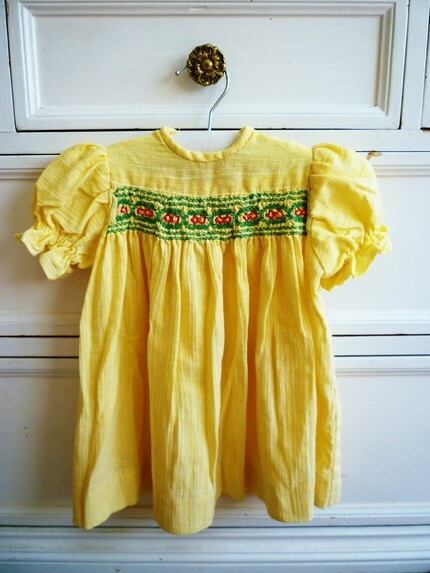 As mentioned in a previous post, I have a small gathering of vintage that I've been collecting (hoarding) since my little venture into selling vintage childrens' clothing last year (short lived but fun)! I had to redirect my attention from selling it once life got too busy with growing a baby but I still keep an eye out for it whenever I go thrifting. Below are some recent online finds. 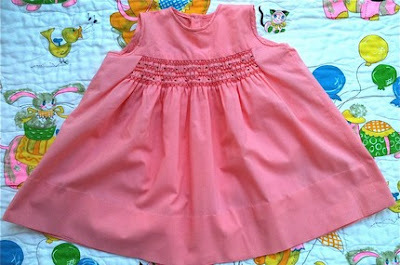 I love this vintage inspired handmade dress. I solemnly swear to make at least five of these smocks/tops for Ruby to wear this month and through the Fall over tights and tops. These rompers made from vintage fabrics with the ruffles on back are KILLING me. SO adorable. Apparently they were inspired by vintage swimsuits. I love this one below! The styling in these photos below are fantastic and their outfits are great inspiration points for a back to school wardrobe for bigger kids. 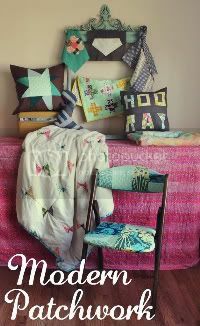 Giddy, Giddy does handmade so well! 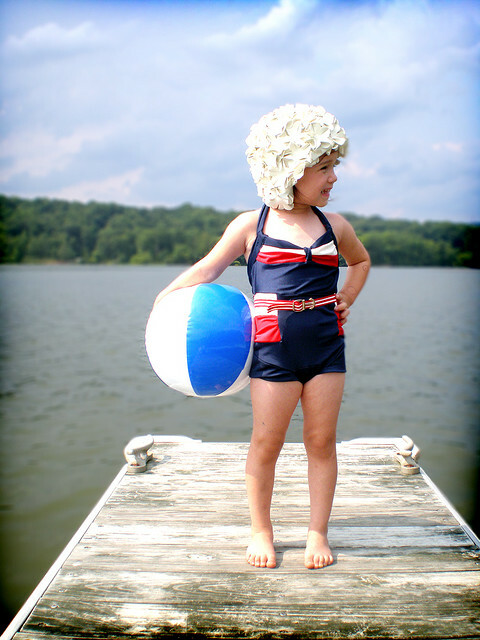 And I'm inspired by ThreeRingCircus to document Ruby's growing collection of vintage! I'm going to enjoy those few years when I get to dress her in whatever I want and cross my fingers that she'll love at least some vintage when she develops her own opinions on what matches and how many layers of pink are acceptable out in public. 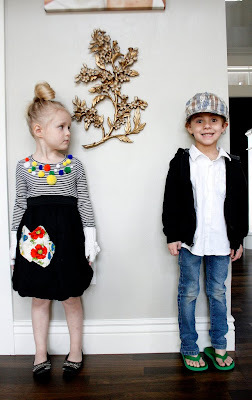 Keep up with all kinds of trendy tots on Modern Kiddo where Alex and Dottie share a Weekly Kiddo as well as plenty of vintage eye candy. 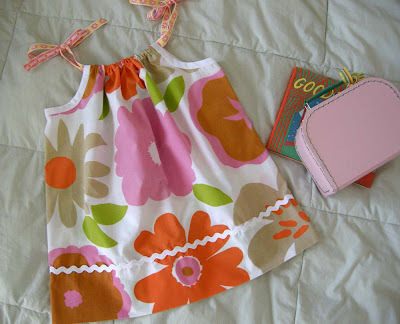 You can get a few pieces for your little people or yourself at BleuBird Vintage or FreckleWonder, two sweet mamas who also appreciate pretty vintage things! 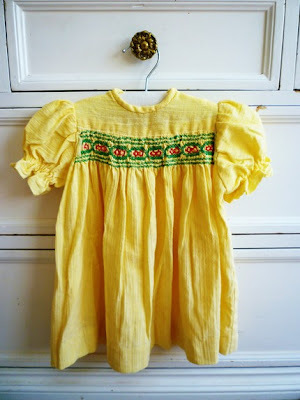 Do you have any favorite vintage finds for little people? Feel free to show your latest finds or favorite vintage shops in the comments below. The dresses that you found are beautiful! I love the smocking on the first two! How I wish I had a little girl! Only when I see clothes like this and think that I might be able to make stuff after the HOME EC class do I want to become a SAHM. SO cute! 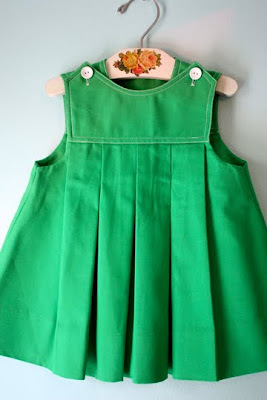 Can you share how to make the smocks/tops when you can? Maybe as an extra for Hoome Ec? Just wondering. I would LOVE to make some of these for my daughter, but have no idea where to even begin! I love vintage so much that I just named my baby Vintage. She was born 6/30. 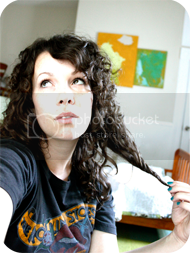 She has received lots of vintage goodies...I am still looking for cute dresses and clothing at a reasonable price. 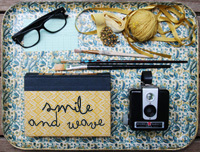 Loving your blog and planning on doing the Home EC class. those rompers are so cute! !